Time Gap: Hidden Object Mystery is a wonderful free game for those who are ready for a change and adventure. Absolutist Games have come up with a great mixture of puzzles to challenge and entertain you as you travel from one place to another. Not only you travel globally, you also have some of the most interesting companions. The characters and the locations are quite realistic, detailed, and quite colorful. Great for your virtual travelling! 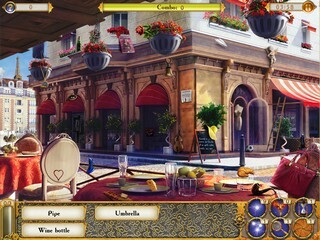 The game starts out with a nice peaceful scene on one of the streets in Paris, France. Then BOOM! Everyone disappears... It is up to you to discover what happened to the humans all over the place. Every possible place is empty - streets, houses, cars. You are supposed to your own investigation to solve this mystery. You have an interactive map to go from place to place and unlock new places. T=One of the fun things of this game is that the spirits of some of the greatest people of human history are going to help you out. The game looks and sounds very well. The characters and the locations are quite realistic, detailed, and quite colorful. Great for your virtual travelling! The game offers some in-game purchases that range from $0.99-$99.99 for powe-ups and other helpful items. As you travel you learn some new facts about those famous people (Cleopatra, Lincoln, Einstein etc), whic can be even educational for the younger player (they might learn the names and their stories, but you might want to double check the facts). The game play is very interesting and diverse. 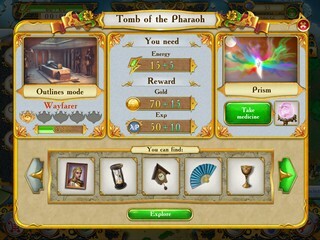 For example, some of the hidden object scenes get more complicated because of some natural disasters and other catstrophes - like searching in a complete darkness. 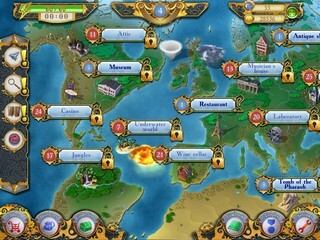 The game is full of other shooting and matching and sliding levels along with the hidden object scenes. You get to play match 3 levels, a snooker game, and a fun bubble shooter. Jumping from one place to another and from one kind of game to another makes almost impossible to get bored with this game. It is great game to have on you device - either mac or android - for times when you have a spare minute! This is Time Gap: Hidden Object Mystery review. Download this game here.